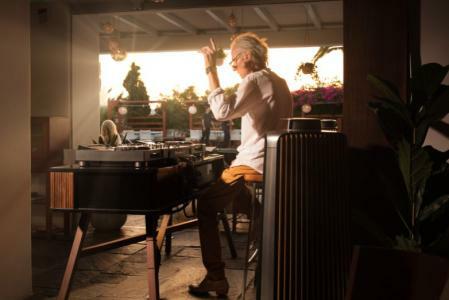 Belvedere’s legendary DJ, Hans Havenaar, talks about his own private Mykonos, he comes clean about everything that bothers him about the island and reveals all its hidden treasures. He answers the phone with “good day”. He speaks very little Greek but you can immediately tell he’s been assimilated. 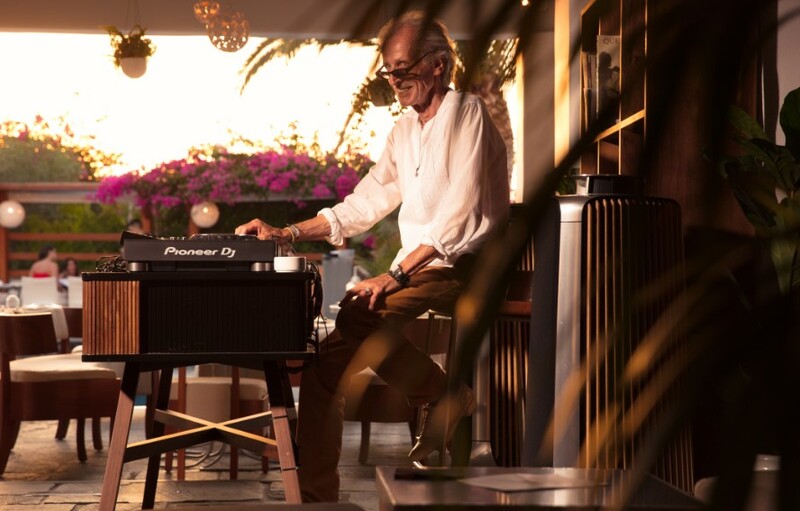 At 68 years old, Belvedere’s resident Dutch DJ, the amazing Mr. Hans Havenaar, knows Mykonos like the back of his hand. He knows exactly what he likes about it and has experienced the local nightlife more profoundly that anyone else, which is probably why he tends to avoid it. 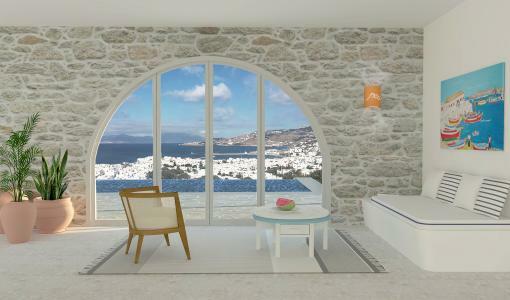 When did you first come to Mykonos? It’s been more than 25 years now. I spent a lot of my winters in the Netherlands though, where I was working as an interior decorator and I’d return in the springtime. How did you happen to find yourself in Greece? Long story… I used to visit France often and at some point I found myself in Corsica, where I fell in love with the weather and the sunshine. Later on, I made my way down to the Greek islands. I never took planes, I always travelled by boat and the scenery was amazing. 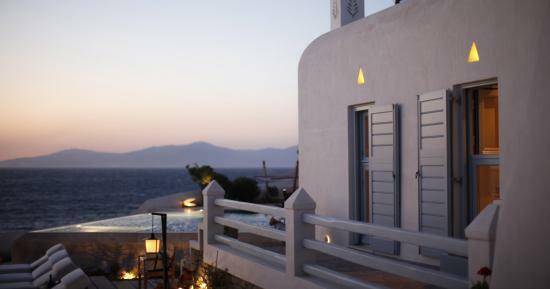 Mykonos has a lot of hidden beauty; you just need to keep your eyes open. Most people come here to get drunk, to dance, to make love, to go wild. But what I found here was inner peace. I met local fishermen, carpenters and plumbers. Those people are my friends now. Is the nightlife these days different to what it used to be, back when people had more money to spend? Greeks have always liked to party. 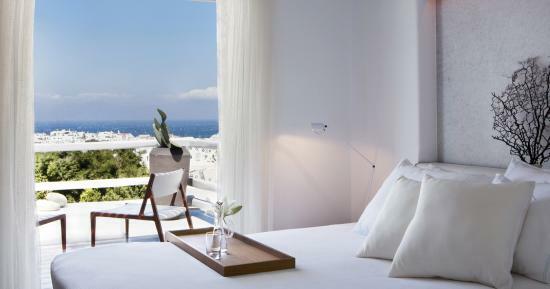 Mykonos is changing, just like everything else. There’s a new generation taking the reigns. Nothing stays the same. “Everything flows,” like one of your philosophers used to say. So how do you spend your nights? I get off from Belvedere at 1am. Most people usually go someplace else afterwards and are always asking me to join them, but I never do. Otherwise I’d be drunk within the hour and I know it. I get free shots everywhere I go. Going out doesn’t hold the same allure for me any more. Most places don’t have a distinct identity, there are no jazz bars or Latin clubs any more. Everyone plays house and techno. Even the snack bars blast house music in the middle of the day! I’m all for progress, if that’s what you wanna call it, but I find clubbing very predictable. I’m not judging, Mykonos lives off of that, but I’m personally over it. But in the ‘90s when you hadn’t given up yet, what were things like? I was out from 1am until the early morning and I always got trashed! But the soundscape was very different. You’d hear Latin music, Brazilian tunes… I still remember The Yacht Club, where I’d go in the wee hours of the morning. It was a wild time. If you were to hang out with me, you’d be so hangover the next day, you’d hardly be able to move! Doesn’t this sort of thing happen any more? These days, kids go to the beach at midday, they eat then go back to their hotel, go out and then sleep during the day. It’s like clockwork! There’s no impulse. A DJ comes on and all they want to do is post on Facebook and take selfies… You used to be able to strike up a conversation the minute you walked into a bar, now everybody’s on their phones. What’s the best bar on the island? 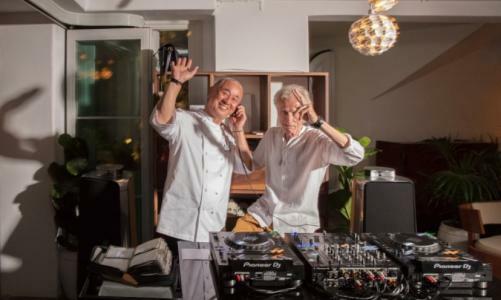 Cavo Paradiso has certainly built a reputation and they truly deserve it. They invite world-class DJs and it’s mass hysteria out there between 2 and 6pm! A lot of beach bars get really pumping. You know, here in Mykonos people get drunk twice a day. Once at midday, on the beach, and once late at night. 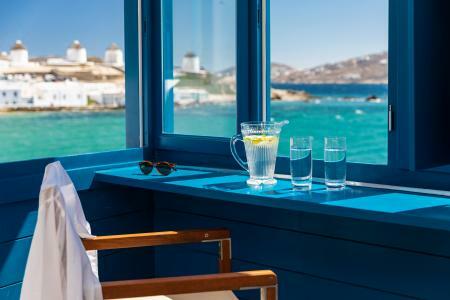 In your opinion, when is the best time to visit Mykonos? In the spring or in October, when the madness dies down. The kids leave and the tourists go back home and you can enjoy the island at a slower pace. That’s when I get on my bike, go to Paranga beach and eat at Tasso’s tavern. I go to Central and Μalama Café or to Agios Stefanos, to this bar called Dublin, owned by a Greek-Irish guy to watch the sunset. I also love those little taverns meant for the locals. They’re very traditional and they serve healthy food at reasonable prices. I don’t even know what they’re called, it just feels like eating in someone’s kitchen! What bothers you about the summer? During the high season, the crowds can drive you nuts. Which is why people always say you have to live here if you really want to get to know the island. Summer is pure insanity. But if you stay until the fall, that’s when you really get to know what life is like. The weather is wonderful until November. …it would be “Island in the Sun” by Harry Belafonte. What kind of music do you play at Belvedere? I wouldn’t say I stick to any particular genre. It’s a musical journey around the world. Belvedere is a hotel, it’s not nightclub, so there’s a lot more freedom. I generally observe the people who come in and I try to sense their mood. I have some friends who come back every year and they know me inside out. Amigos de la musica!